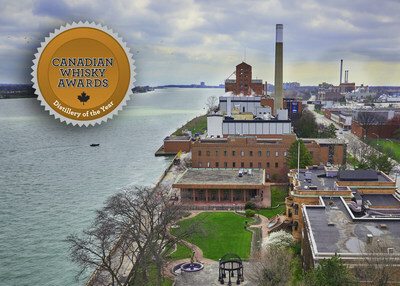 WINDSOR, ON, Jan. 29, 2019 /CNW/ - For the second consecutive year, the Canadian Whisky Awards has named Hiram Walker and Sons Ltd. as Distillery of the Year. Whiskies produced at the distillery also earned a total of 30 prestigious awards, and Hiram Walker's Master Blender, Dr. Don Livermore, was bestowed the first ever Blender of the Year award. The Canadian Whisky Awards recognizes the very best in Canadian whisky, where this year's event had over 100 whiskies entered in the competition. The competition is judged by an independent panel of whisky experts that selects the winners after tasting each whisky blind. The Awards were held on January 17th in conjunction with the Victoria Whisky Festival. "Hiram Walker's Canadian whiskies has roots that go back to the very beginning of Canada's history. 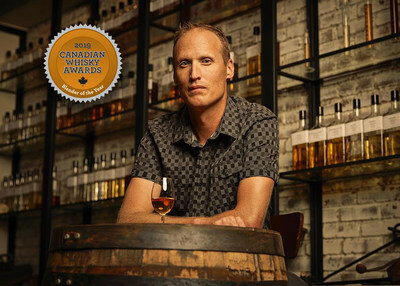 Its award-winning whiskies proves that it is still at the forefront of constant innovation and delivering the very best in Canadian whisky to consumers across the country, thanks to our strong team of people who are bold, creative, and passionate." says Patrick O'Driscoll, President of Hiram Walker & Sons Ltd.
J.P. Wiser's 35 Year Old was named Connoisseur Whisky of the Year, Pike Creek Rum Barrel Finish was named Sipping Whisky of the Year, Gooderham & Worts Eleven Souls was named Canadian Whisky Blend of the Year, and Hiram Walker's Master Blender, Dr. Don Livermore, was the first ever recipient of the new Canadian Whisky Blender of the Year award. "To be recognized as the Blender of the Year in such a crowded field of entries was a great tribute and an honour," says Dr. Don Livermore, Master Blender. "It takes a team of talented people from all types of disciplines to make great whisky. Our whiskies such as J.P. Wiser's, Lot 40, Gooderham & Worts, and Pike Creek are competing on the world stage in terms of quality, innovativeness, and reputation. It is great feeling and a sense of pride to showcase our Canadian made whiskies to multi-national markets." Located in the city of Windsor, Hiram Walker & Sons distillery is the only "grain to glass" operation in Ontario and boasts the largest distillery capacity in North America with 37 fermenters, offering a wide range of unique blends from the use of different grains to the substantial maturing inventories in differing barrels. Hiram Walker produces award-winning Canadian spirits such as J.P. Wiser's, Lot No. 40, Pike Creek, and Gooderham & Worts, which are distributed in Canada by its affiliate, Corby Spirit and Wine Limited. Established nearly 160 years ago, Hiram Walker & Sons Limited's tradition of blending quality ingredients, processes and highly skilled people continues at the Windsor, Ontario based production facility. Hiram Walker produces brands such as J.P. Wiser's®, Lot No. 40®, Pike Creek®, Gooderham & Worts® and Royal Reserve® Canadian whiskies, Polar Ice® vodka, Malibu® and Lamb's® rums, and McGuinness® liqueurs for Canadian distribution by its affiliate, Corby Spirit and Wine Limited. Hiram Walker is a subsidiary of Pernod Ricard S.A., a leading global spirits and wine company with premium international brands such as ABSOLUT® vodka, Chivas Regal®, The Glenlivet® and Ballantine's® Scotch whiskies, Jameson® Irish whiskey, Beefeater® gin, Kahlúa® liqueur, Mumm® champagne, and Jacob's Creek®, Stoneleigh® and Campo Viejo®.